The principle objective of this report is to analysis Performance Evaluation of Al-Arafah Islami Bank Limited. General objectives of this reports are to evaluate financial affairs of the Bank, to diagnosis the key financial problem areas of AIBL, to visualize the quantitative and qualitative aspects of AIBL, to evaluate the over all performances of the employees of AIBL, to evaluate the over all Financial Performances of AIBL and to identify policy recommendations for further improvement. Finally this report make swot analysis Performance Evaluation of Al-Arafah Islami Bank Limited. Financial sector of Bangladesh, like most developing countries, is dominated by banking enterprises. Banks at early stages of history of Bangladesh were nationalized and there was mismatch between assets and liabilities. Currently, the banking sector comprises of 4 nationalized commercial banks (NCBs), 5 government-owned specialized banks (SBs) dealing with development finance in specialized sectors, 30 private commercial banks (PCBs) and 10 foreign commercial banks (FCBs). The structure of the banking system has changed substantially over the last few years. NCBs’ role has gone down. Their share in total assets went down from 54 percent in 2004 to 40 percent in 2008. On the other hand, PCBs’ share went up from 27 percent in 2004 to 43 percent in 2008. The change reflects adoption and implementation of new policies for the banking sector. One important challenge that the banking sector is facing is the introduction of information technology in the banking system in an aggressive manner. This is required to improve management efficiency, reduce operational cost, improve customer services, and increase transparency. The earning and profitability of the banking sector have also improved in recent years and it is generally measured by Return On Assets (ROA) and Return On Equity (ROE). Hence, the banking sector would play a vital role in the development of the country and efficient and sound banking management would lead the country to reach at the highest peak of success. To evaluate financial affairs of the Bank. To diagnosis the key financial problem areas of AIBL. To visualize the quantitative and qualitative aspects of AIBL. To evaluate the over all performances of the employees of AIBL. To evaluate the over all Financial Performances of AIBL. To identify policy recommendations for further improvement. It is operated within chart/ organogram. Relation to each other is excellent. Business like investment in trade, project and small & medium entrepreneurship are handled here. It has relations with mass population as the bank open A/c with minimum balance and Established Al-Arafah Islami Bank Foundation for helping poor and meritorious students. It also provides sewing machine to distressed women, rickshaw to poor labour, and distribute cow, goat to the poor people. It has educational program like as Al-Arafah English Medium Madrasah and helps in health sector establishing charitable dispensary. It also provides Tube-well and sanitary latrine to the unhealthy area of poor inhabitants. From the operation and culture of the bank, client/ society and bank itself benefitted. Operations Wing: Headed by Additional Managing Director, this wing is responsible for all General Banking operations and control to the Branches. Investment Wing: Headed by a Deputy Managing Director, this wing processes Investment proposals received from different branches, analyze them and get approval from the competent authority. This wing also responsible for monitoring the Bank’s Investment portfolio. International Banking Wing: Headed by a Deputy Managing Director, this wing processes foreign transaction, foreign exchange, foreign remittance etc. Audit Division: This division is responsible for overall Audit & Inspection of the Bank. Human Resources Division: This division is responsible for recruitment, training, posting, promotion of employees and also for pays and perks. Financial Administration Division: This division is responsible for keeping books and accounts of the Bank. Establishment and Common Services Division: All Establishment and engineering works, common services and development works are done by this division. Departmentalization at branch level: It is a group job on the basis of product or customers flow. In my organization group job practice are being done in every department for example in general banking there are different group like T.T section , D.D section , P.O section, O.B.C section, Cash section, Accounts section and IT section. A group of officers has been working in every section, they have been working like a team and every member works towards its goal. In today’s business environment where technology plays a dominant role the importance of skilled human resources are ever increasing. The bank is fully committed to ensure a perfect fit between the right person for the right job and assist them to develop their core competencies and technical skills. A good working environment and people related policies generate team spirit and promotes a high level of loyalty, commitment and devotion on the part of its employees. AL-ARAFAH ISLAMI BANK LTD. particularly stressed the need of training and sent a number of executives for various trainings and seminars abroad in 2004 to 2008. The Bank’s training institute conduc bank related various aspects of training and work-shops every month. To maintain or improve each employee’s job satisfaction and morale by letting him/her know that the supervisor is interested in his/her job progress and personal development. To serve as a systematic guide for supervisors in planning each employee’s further training. To assure considered opinion of an employee’s performance and focus maximum attention on achievement of assigned duties. To assist in determining and recording special talents, skills, and capabilities that might otherwise not be noticed or recognized. To assist in planning personnel moves and placements that will best utilize each employee’s capabilities. To provide an opportunity for each employee to discuss job problems and interests with his/her supervisor. To assemble substantiating data for use as a guide, although not necessarily the sole governing factor, for such purposes as wage adjustments, promotions, disciplinary action, and termination. The distribution of proper forms in a timely manner. Ensuring completed forms are returned for file by a specified date. Ensuring proper safeguard and filing of completed forms. Developing Evaluation Support Form in concert with each employee. Continuously observing and evaluating an employee’s job performance. Holding periodic counseling sessions with each employee to discuss job performance. Completing Performance Evaluation Forms as required. Reviewing the evaluation for accuracy and objectivity. Investigating and resolving any disagreement(s) between the supervisor and the employee. Ensure the proper and timely distribution of forms. Ensure that any conflicts identified have been resolved in a fair and equitable manner in accordance with existing regulations. Evaluation Support Form: An Evaluation Support Form will be completed for each employee. This is a joint effort between the employee and his/her immediate supervisor. Evaluation Support Forms will be completed for all new employees within five working days from date of employment. A copy will be given to the employee. The original will be retained by the immediate supervisor. This form should be reviewed annually and revised as necessary to indicate any significant changes in duties and/or responsibilities. The support form is designed to increase planning and relate performance to assigned responsibilities through joint understanding between the immediate supervisor (evaluator) and the employee as to the job description and major performance objectives. Counseling Sessions between immediate supervisors and employees will be scheduled periodically. During these sessions, an open dialogue should occur which allows the exchange of performance oriented information. The employee should be informed of how well or how badly he/she has performed to date. In the case of derogatory comments, the employee should be informed of the steps necessary to improve performance to the desired level. Counseling sessions should include, but not be limited to, the following: job responsibilities, performance of duties and attendance. A memorandum for record will be prepared following each counseling session and maintained by the supervisor. Complete the evaluation form as promptly as possible. Note that any area evaluated as Inadequate, Minimally Meets Requirements, or Exceptional must be discussed in Comments section of the evaluation form. Describe why performance is not satisfactory and specify how performance can be improved, or explain why performance is outstanding. Discuss evaluation with the employee emphasizing strong and weak points in job performance. Commend the employee for a job well done if applicable and discuss specific corrective action if warranted. Set mutual goals for the employee to reach before the next performance evaluation. Recommendations should specifically state methods to correct weaknesses and/or prepare the employee for future promotions. Allow the employee to make any written comments he/she desires. Have employee sign the evaluation form and initial after supervisor’s comments. Forward the original copy of the evaluation form in a sealed envelope, marked Personal-Evaluation Form to the appropriate reviewing official. Retain a copy of the completed form for the department and the employee. Subsequent to the completion of this evaluation by the supervisor, and review by the employee, revisions must be discussed by both parties. In addition, if changes in the form are made after the employee has signed the form, the level of authority making the changes must notify the immediate supervisor and give the employee and supervisor copies of the revised evaluation. Review the evaluation form for objectivity and accuracy. If the employee has stated that he/she disagrees with the evaluation, the Reviewing Official will attempt to resolve these disagreements prior to forwarding the evaluation form. Comments as to conflict resolutions are required. Forward the original evaluation form to the appropriate Director/Dean in a sealed envelope marked, Personal-Evaluation Form. Review each form to ensure proper actions have been taken to resolve any identified conflicts. Account for all evaluation forms in his/her area of responsibility. Forward all original forms together as a group to the Office of Human Resources in a sealed envelope marked Personal Evaluation Forms. Upon Human Resources’ receipt of the completed evaluation form, it will be reviewed for completeness and accuracy. Any unresolved problems will be brought to the attention of the next line of authority. The completed form will be placed in the employee’s permanent Personnel File. New Employees will be evaluated during the fifth month of employment. On the first working day of the fifth month of employment, the Human Resources Office will send the new employee’s supervisor a Probationary Evaluation Form (ETSU Form 12). The evaluation form will be processed as outlined above. If job performance is judged to be unsatisfactory, a memorandum recommending termination will be forwarded with the completed Probationary Evaluation Form. Knowledge of work – How well does the employee know his or her job? In order to successfully complete the duties and responsibilities of this position, what level of technical knowledge does the employee demonstrate? Quantity of Work – Is employee’s rate of production adequate? How does employee’s production compare with that of others? Does employee display efficient use of time? Quality of Work – Does the employee make frequent mistakes? Does employee’s performance require constant supervision in order to ensure accuracy? Does employee take pride in his/her work and strive for excellence? Initiative – Does employee volunteer for new assignments and responsibilities? Does the employee require a great deal of supervisory guidance regarding initiative? Does employee initiate new methods or techniques? Dependability/ Responsibility – Does employee consistently fulfill responsibilities? How much follow-up is required? How reliable is this employee? Quality of Interpersonal Relationships – Does employee create resentment in fellow employees? How tactful is employee when communicating with fellow employees? Does employee promote teamwork? Is employee cooperative with fellow employees and supervisors? Attendance – How often is employee absent or late? Does the employee notify his/ her supervisor promptly when absence or tardiness occurs? How does the employee’s attendance record compare with others? Punctuality – Is the employee consistently prompt? Is there an impact on his/her job performance? Supervisory Ability – Does employee exert a positive influence on others? Does employee demonstrate fair and equal treatment of subordinates? Does employee demonstrate the ability to make sound feasible decisions? Does the employee attempt to resolve problems at the local level? Job Knowledge – Possesses the technical knowledge necessary to accomplish all job requirements. Understands the facts and information related to work assignment. Accomplishment of Objectives – Contributes to goals of department/division.responsible. Quality of Work – Consider the thoroughness, accuracy and dependability of results of work. Productivity – Meets deadlines, adapts to changes, uses resources efficiently. Uses good judgment in establishing priorities. Initiative and Creativity – Self-motivated, develops new methods and procedures. Interpersonal Relationships – Motivates and develops others. Builds teamwork. Communicates with peers, subordinates and others. Cooperates with persons outside of department. Supervisory Skills – Develops sound, practical solutions. Makes prompt decisions, accepts responsibility, resolves disputes. Dependability – Follows through to meet schedules. Makes sound decisions. Makes positive contributions. Consider reliability. Professional Contribution – Contributions made on the part of the employee to the staff, students, university, community and state or region. A rating should not be based on a few isolated performance incidents. When this is done, the rating is unfairly influenced by non-typical instances of favorable or unfavorable performances. The “Halo” effect occurs when one factor influences ratings on all factors. Examples: An employee’s work is of good quality, therefore, other ratings (such as those on promptness or work quantity) are higher than normal. Another employee is frequently absent, with the result that the ratings on other factors are usually low. The tendency to consider everyone in the work group as above average, average, or below average. Some raters are considered “tough” because they normally “cluster” their people at a low level. Others are too lenient. “Clustering” overall ratings usually indicates that the rater has not sufficiently discriminated between high and low levels of performance. Individuals in higher-rated jobs are often considered superior performers to those in lower-rated jobs. This normally means that confusion exists between the performance appraisal and how the job has been evaluated. There is a tendency to allow the period of an individual’s employment to influence the rating. Normally, performance levels should be higher as an individual gains training and experience, but this is not always the case. Avoid judgments made purely on the basis of personality traits. Effective, efficient employees do not necessarily agree with everything a supervisor believes in or states. Consider the entire appraisal period. Try to enumerate high points and low points in performance, then assign a rating that typifies the individual’s normal performance. Do not attempt to assign a rating to a performance indicator and then create justification to support it. Be able to explain the reason for each rating. In a group of people in similar jobs, performance is likely to be spread over most performance categories. Review your own record as a rater. Check the tendency to be either “too tough” or “too lenient” in your appraisals. Consider how an individual is performing in relation to what is expected. Rate the person’s performance, not importance of the job. Recognize that some people may never achieve top ratings, regardless of length of service. Watch closely the progress of newcomers and be ready to recognize superior performance if it is achieved. The Executives/Officers and concerned officials shall have to be trained intensively and extensively regarding the rules, procedures and modalities of Musharaka Investment so that no lapses occur at sanction and post sanction stage Moreover the supervision and control shall also have to be ensured at all stages to ensure end use, prevent diversion and generate income. Apart from the above training programmed for motivation and clear conception of Client shall have to be arranged before disbursement and after disbursement. A sum of money left within a bank or financial institution for safe-keeping or to earn interest on it. It is the prime sources of bank’s investment, which allowed the bank to generate profit against the investment. The main source of income of the bank is investment and the main source of investment is depositors money. The terms “Bai-Murabaha” have derived form Arabic words Bai and Ribhum. The word “Bai” means purchase and sale and the word ‘Ribhum’ means an agreed upon profit. So Bai-Murabaha means sale for an agreed upon profit. It may be defined as a contract between a Buyers and a Seller under which the seller sells certain specific goods permissible under Islamic Shariah and the word Law of the land to the Buyer at a cost plus and agreed upon profit payable today or on some date in the future in lump-sum or by installments. The profit may be either a fixed sum or based on a percentage of the price of the goods. The word Musharaka is derived from the Arabic word Sharikah meaning partnership. Islamic jurists point out that the legality and permissibility of Musharakah is based on the injunctions of the Holy Qura’n, Sunnah and Ijma (consensus) of the scholars. One, two or more entrepreneurs approach an Islamic Bank to request the financing required for a project. The bank, along with other partners, provides the necessary capital for the project. All partners including the Bank have the right to participate in the project. The profit is distributed according to an agreed ratio. However, losses are shared in exactly the same proportion in which the different partners have provided the finance for the project. The term Mudarabah refers to a contract between two parties in which one party supplies capital to the other party for the purpose of engaging in a business activity with the understanding that any profits will be shared in a mutually agreed upon. Losses, on the other hand, are the sole responsibility of the provider of the capital. The first party provides capital and the other party provides the expertise with the purpose of earning lawful profit (approved by Islamic law) which will be shared in a mutually agreed upon proportion. The term ‘Bai’ and ‘Muajjal’ are derived from the Arabic words ‘Bai’ and ‘Ajal’ where ‘Bai’ means purchase and sale and ‘Ajal’ means a fixed time or a fixed period. So Bai-Muajjal is a sale for which payment is made at a future fixed date or within a fixed period. In short, it is a sale on Credit. It is basically a contract between a buyer and seller under which the seller sells certain specific goods, permissible under Shariah and law of the country to the buyer at an agreed fixed price payable at a certain fixed future date in lump-sum or in fixed installments. The term Bai-Salam is used to define a sale in which the buyer makes advance payment, but delivery is delayed until some time in the future. Usually the seller is an individual or business and the buyer is the bank. The Istisna’a sale is contract in which the price is paid in advance at the time of the contract and the objective of sale is manufactured and delivered later. The majority of the jurists consider Istisna’a as one of the divisions of Bai-Salam. The definition can be stated as “It is contract with a manufacturer to make the something” and “ It is a contract on a commodity on liability with the provision of work”. It is a contract in which one of the parties (the lender) places into the ownership of the other party (the borrower) a definite parcel of his property, in exchange nothing more than the eventual return of something in the same value of the property loaned. Qard-E-Hasana loans are granted compassionate basis and no service charges are imposed on the borrower. Irregular/stuck-up/over-due investment in a Bank increases at a faster rate and the same ultimately jeopardize the interest of the Bank. In this connection we append below the causes of irregular/Stuck-up and overdue investment for immediate attention of the concerned officials so that the trend in this regard can be arrested. a) The client should be an honest man of active habits with firm commitment. His honesty and integrity must be undisputed. b) He must be a good businessman having sufficient experience in the related line of trade. He should also have good track record of repaying bank investment. c) He must deploy his own capital in the business and capacity to bear the loss as well as to run the business. He must have foresight for predicting future market conditions. d) He should deal in such commodities which have social utilities and Shariah permissibility. Investments are often allowed violating Discretionary Power of the Branch Manager which ultimately result in irregularities. Under no circumstances Discretionary Power should be exceeded. In case any investment is allowed due to emergencies of circumstances beyond Discretionary Power with prior permission of Head Office over telephone that should be got confirmed in writing and formal approval should be obtained without delay. The Client must have business establishment within Bank’s command area. Some times branches make investment in remote/distant place beyond the command area of the branch. As a result branch can not ensure effective supervision and control over the investment. Therefore, while making investment, branches should ascertain that the business establishment of the investment client is within the command area or within reasonable distance for ensuring easy and effective supervision and control as well as constant follow-up for timely recovery of investment. The net worth of the party must be ascertained properly. Nevertheless, the investment in business, cash flow and liquidity position are also to be ascertained. In fact Bank takes decision for making investment among others on the net-worth of the party. If the net-worth is not ascertained properly bank interest may be jeopardized subsequently. Market report and Bank’s confidential report are not obtained. The means and standing of the party as well as performance with the previous/ present banker is to be obtained, checked and verified. Party’s own investment in business both in cash and kind should be properly ascertained. In addition cash inflow and outflow in business should also be examined by referring to statement of account. Proper purchase and sale of goods must be done correctly and possession of commodity shall be obtained. In this connection price, quantity and quality must be properly ascertained. Purchase memo/cash memo, shall be obtained in the name of the Bank. Disbursement of investment are made before completing documentation formalities and obtaining proper securities. Proper charge documents in respect of collateral securities relating to property offered as collateral must be obtained. Original title deeds of mortgaged property, via deeds, C.S., S.A., R.S./B.S. and mutation parcha up to date rent receipt, non encumbrance certificate with charge fee receipt, Memorandum of deposit of title deeds, affidavit etc must be obtained. Legal opinion on the title deed shall also be obtained from bank’s panel lawers.. Registered mortgage of property shall be obtained on execution of deeds drafted by legal advisor. The quality and quantity of Murabaha goods are to be properly verified and checked at the time of purchase and storing. The Murabaha Goods should also be verified at regular interval to ensure that the quality is not deteriorating. While receiving the goods in the godown, the Officers concerned should verify the quality and quantity and ensure receipt of the goods in good conditions. Goods should be purchased at the whole sale market price. Overpricing should always be avoided to avert possible shortfall. The price trend of the commodities for the last one year should be kept in view and accordingly percentage of cash security should be fixed-up so that Bank’s interest is not jeopardized due to fluctuation. Murabaha Investment against slow moving/obsolete/hazardous/less demandable items should always be avoided. Overnight watch and ward arrangement of godowns are to be made. Some times Godown Staffs are utilized for office works of the Branch which should be avoided. Godown Staffs must be deployed in godown for proper control and supervision of Murabaha Stock. Authorized Officials must inspect the Godown at least once in a month and certificate in this regard must be kept in Branch record. The duties and responsibilities of Godown Staffs must be spelt out in clear terms. Branch must also ensure that the Godown Staffs are discharging their duties properly. Excess delivery and delivery without receiving payment result in unadjusted shortfall which is a gross irregularity and tantamount to defalcation. Therefore, it must be ensured that excess delivery or delivery without receiving payment does not occur. Some times keys of the Godown are not properly handled and the same is delivered to the party. This is not only a great lapse but also fraught with great risk. Under no circumstances Godown Keys should be handed over to the party or any unauthorized person other than the Bank’s Officials. Very often Murabaha Goods are stored haphazardly and piled-up position . As a result the actual position of goods can not be ascertained. Goods must be stored in countable manner with due care so that the quality and quantity can be determined at any time. Bank signboard is not displayed in and outside the Murabaha Godown which must be invariably displayed. Stack Card should be displayed with up to-date information on each consignment for easy counting and identification. Delivery Orders should be issued properly filed in with necessary posting in Stock and Delivery Register. Comprehensive Insurance covering value of entire stock + 10% above the cost should be obtained from enlisted Insurance Company. Some times the stock of goods against Murabaha/MPI remains stored for years together. Branch Managers should not allow the stocks to continue for a longer period to avoid damage, pilferage, licking and fall in demand/price. Bai-muazzal investment should not be allowed to any one who does not have own shop. The shop must be visited by the responsible official to ascertain his over all business position. Since Bai-muazzal investment amounts to cash loan therefore the need of Baimuazzal Investment shall be carefully determined, Baim. Investment should not be more than 30% of own investment of the client. Bank’s officials must pay regular visit to the shop of the investment clients so that the investment client feel obliged to make regular transaction in current account as well as repay investment in time. Stocks in Business are not verified by obtaining Stock Report at regular intervals. Monthly stock-report should invariably be obtained from the clients. Proper adequate and easily saleable collateral securities are to be obtained. Value of the collateral security is to be properly assessed and forced sale value thereof should be ascertained correctly. Insurance shall have to be obtained covering risk of fire RSD etc. on hypothecated stock which many branches don’t obtain. Follow-up and frequent contact before due date and constant persuasion on or before due date are to be made by the branches for timely adjustment and to avoid over dues. Equity as per norms and practice is not being recovered before disbursement of HP(SM) investment. Proper and adequate equity should invariably be obtained supported by collateral security for the rest amount. Machinery and Vehicle of recent model and make shall have to be procured. Before procuring machinery and vehicle, it’s technical feasibility must have to be ascertained. From the experience it is observed that unless machinery and vehicle, is found technically viable the investment client cannot repay the investment as per schedule. In case of vehicle it must be get registered in Bank’s name only and insurance cover note, road permit, tax token must be obtained in Bank’s name. The vehicle/machinery must be inspected at least once in a month so that the same cannot be shifted elsewhere/another route/place without Bank’s knowledge. In the event of party’s failure to pay 3(three) consecutive installment the vehicle/machinery shall have to be taken into Bank’s possession, if necessary, with the help of law enforcing authority. On expiry of previous insurance fresh insurance cover shall have to be obtained. To regularize/recover irregular/stuck-up/overdue investment and in order to overcome the situation all concerned shall adhere to the following procedures for recovery of aforesaid investments. In this regard a brief definition of irregular/stuck-up/overdue investment is also given. An investment is said to be irregular when regular repayment is not made as per schedule of repayment, improper documentation leads to non-repayment and when value of security falls down/security become obsolete or security available does not patch the investment outstanding. An Investment is said to be stuck-up when repayment is stopped as a result of closing of business, death of Investment Client and for any other unforseen circumstances rendering the investment client unable to pay. An Investment is said to be overdue when repayment does not come within the period of investment or expiry of the limit and in case of bills repayment is not received on due date. In order to ensure timely recovery of investment, supervision at all stage shall be ensured. This will include supervision from the date of disbursement to total repayment. In case repayment as per schedule does not come the Manager shall personally enquire about the causes of non repayment. If he is convinced that the difficulty is temporary in nature and is likely to overcome shortly he should discuss the situation with the investment clients and obtain reasonable definite repayment schedule under intimation to Head Office. Apart from the above as and when any investment becomes irregular/stuck-up/ likely to be overdue, the Branch Manager apart from contacting the borrower in writing shall also consult discuss with the investment clients about his/their difficulties in regularization/ repayment thereof. If necessary the Manager will give suggestion in consultation with Head Office for overcoming the difficult situation. He will personally pursue in such a manner with the investment client so that investment can be realized without hindering good relationship with the investment clients. If necessary he will utilize the influence of the local elites to insist the party to make repayment. Branch Manager will send the Resume of Investment Vide F-87 mentioning therein the latest position of investment, security, irregularities occurred and the efforts made in the meantime for regularization/recovery of the investment as well as suggesting future action. If persuasion does not bring any fruitful result he will issue a final registered demand notice impressing upon the client concerned to repay within 15 days time from the date of receipt of the letter with acknowledgement due. If the investment client does not come forward to repay within a reasonable period, legal notice is to be served through panel lawyer of the Bank with copy endorsed to Head Office. The reaction of legal notice is also to be brought to the knowledge of Head Office with comments of the Branch Manager for further instructions. If filing of suit is allowed by Head Office the same should be filed against the debtor/client concerned and the Guarantor if any under Civil Procedure Code 9 for specific performance to be deemed as breach of contract. In case the investment is not covered by collateral security suit is to be filed with attachment of assets before judgment. On the other hand if the investment is secured by Mortgage of Property Title Suit is to be filed. The copy of plinth as well as copy of written statement submitted by dependent is to be submitted to Head Office for record. In case where the investment is secured by pledge of stock it should be mentioned in the Registered Notice that in case the party fails to lift Murabaha goods on making repayment, the Bank shall dispose off the same by inviting open tender through National/Local daily. In spite of the above if the client does not come forward to lift the goods, tender notice shall be published in two National/Local daily on obtaining Head Office approval. The goods shall be delivered to the highest tendered on obtaining Head Office approval and money/title suit as the case may shall be filed for short fall (if any). For minimizing the cost of advertisement, Tender/Sale Notice of several clients shall be published through one Tender/sale Notice. In case of Hire Purchase Investment, criminal suit under section 406/420 read with section No.98 or 100 CRPC for breach of contract as well as issuance of search warrant for recovery of immovable/movable that is transport/machineries shall be filed in case the investment client fails to repay the installment as per schedule and also do not surrender the assets. After taking possession of the assets, the same shall be sold by inviting tender and Money Suit under section 9 of the Civil Procedure Code for specific performance to be deemed as breach of contract if not backed by Mortgage of property or Title Suit/Mortgage suits for realization of money by selling the mortgaged property wherein mortgagor also can purchase the auctioned property under Civil Procedure Code. The 1st difficulty is that demand/legal notice can not be served for lack of proper and correct address. Therefore, while opening the Account and initiating investment the residential address and permanent address of investment clients and guarantor shall be correctly recorded and accordingly final/legal notice shall be served. Apart from the above the full particulars of assets of investment clients must be obtained while allowing investment so that simultaneously with the filing of Money Suit, attachment of asset before judgment can be made and subsequently decree can be executed on the available assets of the judgment debtors. i) Branch shall follow-up the progress of the suit effectively with the legal advisor by constant touch with him for speedy disposal of cases/ suits. ii) Quick service of Summons on the dependant shall be ensured. In case normal service of Summons is not possible, arrangement shall be made for substitute service i.e by way of publication of Summons on the daily newspaper. iii) Steps shall be taken for attaching the assets of investment clients before judgment so that Bank’s interest remains secured/ safeguarded. iv) Steps shall be taken for issuance of decree by the court at the earliest. As soon as the decree is given by the court certified copy shall be obtained and true copy shall be sent to Head Office. A copy of the decree shall also be sent to the judgment debtor impressing to payoff as per terms of decree. v) It shall be ensured that payment by the judgment debtor is made as per terms of decree. In case of default execution case shall be filed without delay unless otherwise advised by Head Office & decrial amount shall have to be recovered on auctioning the property of the judgment debtor. vi) After filing suit if any compromise prayer is done by the dependent, the terms and conditions of compromise petitions shall be sent to Head Office prior to filing/ submitting the same in the court. vii) If any prayer for amicable compromise is made by the investment client at any stage, the same shall be sent to Head Office with comments and observation of the Branch Manager for consideration of Head Office. a) The financial condition of investment clients turns out poor and his business is collapsed and there is no realizable asset. b) Borrower is not traceable and all efforts to find him out fail. c) Investment becomes timbered for taking legal action. Considering the above points if the Manager is convinced that the investment should be written off he shall seek permission form Head Office for submitting write off proposal in this regard. If any investment becomes time barred by limitation it will be the personal liability of the Branch Manager as well as investment-in-charge if any. In this connection the procedure for computation of time barred by limitation & steps for regularization is appended below. If the Bank’s investment is not backed by any mortgage of immovable property it becomes time barred after 3 (three) years from the date of initiation. In case of investment secured by Mortgage of Property the limitation for filing suit is 12 years form the date of initiation. Provided further that before expiry of the above period if the investment client acknowledge in writing signed by himself or by his duly authorized agent or any payment made by respective borrower by deposit slip signed by him or his authorized agent, a fresh period of limitation shall be computed from the time and date when acknowledgement of debt is signed by him authorized agent or part payment of debt is made by him under his signature or his authorized agent. The deposit of profit if specifically mentioned in the pay-in-slip will, however, not save the limitation. The signing of fresh demand promissory note, letter of continuity or balance confirmation slip by the borrower or by his authorized agent before the expiry of above prescribed period of limitation may be treated as an acknowledgement of debt so as to compute the fresh period of limitation from the date thereof. In this connection, it may be mentioned that mere receipt of the demand notice or legal notice by the borrower or by his duly authorized agent by signing the acknowledgement receipt thereof can not be treated to be an acknowledgement receipt of debt because the acknowledgement receipt bears the testimony of the receipt of the letter and not the contents of the letter i.e. do not testify the acknowledgement of debt by the borrower. The mere reply of bank’s notice without specific admission of debt can not also be treated to be an acknowledgement of debt. But if after the expiry of the above prescribed period of limitation, i.e. three years in case of money suit and twelve years in case of mortgage suit, from the date of initiation of investments, the borrower or his duly authorized agent makes any such acknowledgement of debt or any part payment of his debt or profit as mentioned above the dues shall not be saved from the limitation or the dues shall not get a fresh lease of life unless the borrower or his duly authorized agent along with his acknowledgement of debt in writing also promises in writing to repay signed by him or his duly authorized agent to pay the balance of outstanding dues. Deposits During the period 2004 to 2008, the deposits of AIBL increased at a rate of 29.04% per year. Investment From the period 2004 to 2008, the investments of AIBL increased at a rate of 29.76% per year. Net Profit During the period 2004 to 2008, the Net Profit of AIBL increased at a rate of 92.40% per year. EPS From the period 2004 to 2008, the EPS of AIBL increased at a rate of 92.39% per year. Assets During the period 2004 to 2008, the Assets of AIBL increased at a rate of 29.74% per year. Branches From the period 2004 to 2008, the Branches of AIBL increase at a rate of 8.70% per year. Reserve Fund During the period 2004 to 2008, the Reserves of AIBL increase at a rate of 38.59% per year. ROA From the period 2004 to 2008, the ROA of AIBL increase at a rate of 5.72% per year. Performance Evaluation procedures of Al-Arafah Islami Bank Limited are more or less like other banks. Performance Evaluation procedures of AIBL may be adopted with current procedures of other Banks. Current Data oriented questions may be introduced in the Evaluation procedures. Business related subject may be preferred for performance evaluation in AIBL. Scientific methods are to be followed for Performance Evaluation Procedures. 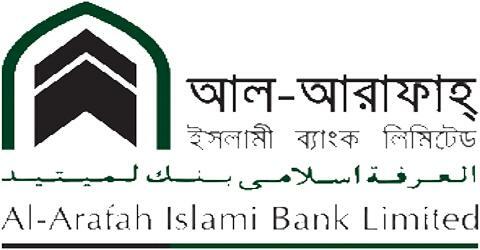 In 2008, the Inspection team of Bangladesh Bank has inspected the branches of the bank. The inspection reports have been presented and discussed in the meeting of the Audit Committee of the Board of Directors. Necessary corrective measures have been taken against repetition of the lapses according to the minutes of the meeting. The lapses/irregularities find out by Bangladesh Bank are comparatively less than previous years. As per Bangladesh bank’s guidelines the Credit Report Information Services Ltd. (CRISL) in 2007 the long term and short term grading were BBB+ and ST-3 respectively. Banking is a business encompassing their employees and the broader communities, as well as their shareholders and customers. They believe that shareholder value is driven by the satisfied and loyal customers. They achieved good success last years, there were number of challenges as they move forward. We hope that the bank will continue to successfully deliver excellent results, meeting their financial and operations objectives-as well the needs of their customers and their people. May the Almighty Allah give them dedication, patience and fortitude to serve the cause of Islam and to go ahead with their mission to run the Bank as per the principles of Islamic Shariah.